One of the greatest joys I have in the Paper Jungle is being surrounded by colors. 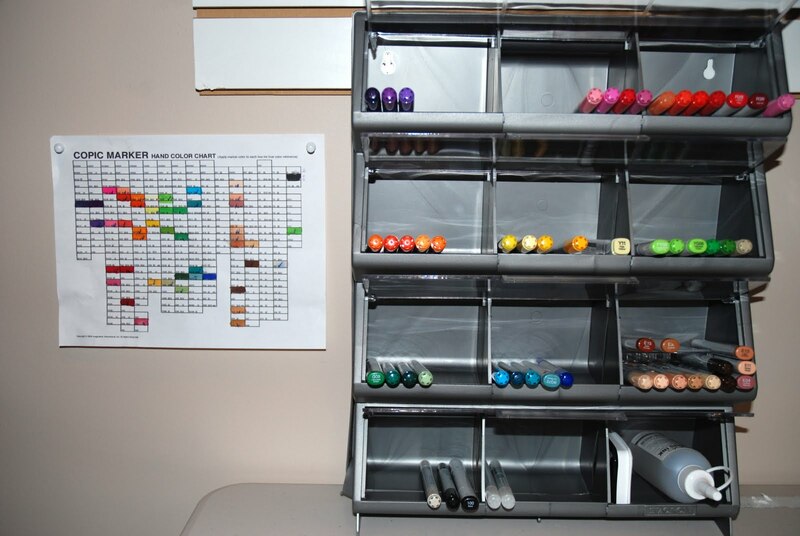 It's why I like to display my paper rather than hide it in racks and stacks, and also why I enjoy displaying my Copic marker collection rather than keeping them horizontal in drawers. And the key to a good, long and productive life for your Copics (and maybe ourselves, too!!) is to keep them as horizontal as possible when not in use. For those who haven't tried these fabulous markers, let me tell you a little about them. 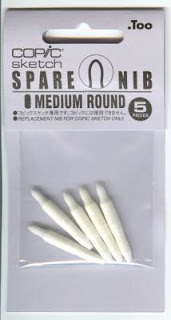 Each has two nibs, top and bottom; one is pointy and fleshy ... the other is square tipped and not as flexible. You probably can tell from my description that I like to use the pointy end, for its detail in small areas, as well as for the sweeping motion I can get when coloring and blending. And before I move on from raving about the markers themselves, know that all of the nibs are replaceable, and each is refillable! There are Copic markers in their round barrel "Ciao" version (a little cheaper, a bit less ink), which I like for their feel in my hand, as well as the most popular "Sketch" version. The Sketch version (and original Copic) can be used in the airbrush system ... I haven't gotten "into" that yet! A bit about the chart on the left in my picture. I lifted it (sorry, unknown source) a while ago, and modified the layout to suit my needs. I think you can get a colored-in version on the Copic marker website (see above), as well. I color in the blocks with my actual marker because often the ink color doesn't quite match the cap color. If you'd like me to e-mail a copy of the blank one to you in a .pdf format, just contact me (form below) and I'll send it to you free for the asking! Now, about my storage unit. 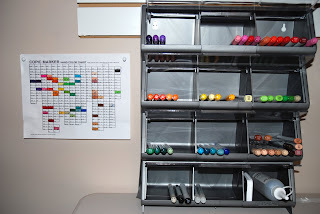 YES, there are "official" storage systems for Copic markers that perhaps I'll buy as I increase my collection. However, they're not widely available in stores and I like to touch-feel before I buy something online. (I'm an old dog!! -- errr, monkey!!) Also, they're expensive. I purchased this 12-compartment case at Lowe's for $14.98. When/if I move up to a different unit, I can easily use this for other functions. For now, it allows me to keep my Copics horizontal, in full view, and with the pointy/juicy end slightly lower as that's the side that I use most often. Color your world today, and make it a happy place! I am enjoying reading all about how you store things in your craft space!!! Keep them coming!!! You are amazing! Want a job coming to help organizing me. Hubby's cooking is a perk . I am loving these posts.